You imagined retirement as a long-awaited reward for all those years of work. Maybe you pictured cruises around the globe, lazy days playing tennis, or plenty of time to spend with your grandchildren. But now that it's finally here, you're not so happy. Maybe you're bored. Maybe you're restless. Maybe you're having trouble paying the bills. Whatever the issue, your retirement isn't the happy time you expected. The solution? You might need to come out of retirement, at least part-time. The most important reason to return to work is if you're struggling to pay your bills each month. Maybe you didn't save enough money during your first go-round in the working world. Maybe your expenses, such as health care, are higher than you expected. Whatever the reason, if your monthly income is barely enough to pay your bills, it might be time to find a job, even a part-time one, to help cover the costs. If you're facing this challenge, know that you're not alone. According to a 2017 report from the Schwartz Center for Economic Policy Analysis, 35 percent of workers from the ages of 55 to 64 didn't have any retirement savings in an IRA or 401(k)-type plan. The median account balance of workers nearing retirement was just $15,000. Maybe you did save for retirement. But now that you're not working, you're finding that those retirement savings are disappearing much faster than you expected. It could be that you've spent more than you expected during your after-work years, or it could be that you underestimated how much money you'd need to support yourself once you stopped working. After all, people are living longer today than ever. 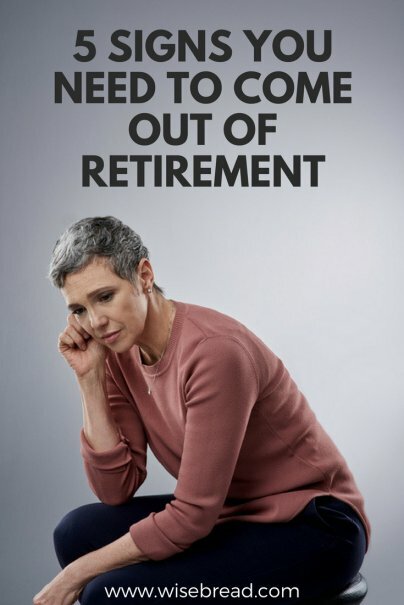 Many people are experiencing retirements that last the same number of years as their career. Work might not always be fulfilling, but it does keep you moving. And that can be an underrated benefit. It's easy to get lazy in retirement. You might spend far too much time sitting in front of the TV or reclining on the couch with a book. There's nothing wrong with a bit of relaxation, but what if you're sitting so much that your health is suffering? Planning on whiling away your days on the golf course, fishing from the banks of your favorite lake, or spending more time with your grandchildren might sound good. And it might be good, too … for a while. The truth is, days can be long when you're not busy at work. All that free time can start to feel more like a burden than a pleasure if you don't know how to fill the hours. You can only read so many books or binge-watch so much TV. It's easy to get bored during retirement, especially now that retirement is lasting so much longer. Getting a new job could alleviate much of that boredom. It will take you out of the house and give you something to do. It doesn't have to be thrilling work, but it could be just enough to make those long, empty hours seem less intimidating. Miss the office chitchat? Miss the after-work drinks on Fridays? Being retired can cut you out from the social interaction that work often provides. You might start to feel lonely once you leave the working world.